It has been over a year since I wrote anything on my blog (sorry); but recently, with various things going on in Hong Kong, I felt compelled to write and share some things that are on my heart. In the last seven months, there have been 24 suicides committed by young people in Hong Kong. This is one too many. Each person ended their life due to various circumstances, but the story line is the same – they felt hopeless and could not see a way out. At an age where a person has their whole life ahead of them, it is hard to believe that their circumstances won over and the hope of a better future was eliminated. But this is the sad reality and we can no longer just ignore the situation. The Hong Kong government and school officials are trying to address the issue but many people are saying that their efforts are not enough. While there are different available organizations and health services, it seems like the students are not seeking help. I know that it is a complicated issue with many different factors such as family background, mental health issues, school pressures, etc. playing a part in the overall problem. Therefore, we have to approach this situation from many different angles; but the first major step is to bring awareness to the crisis. When people are not aware of the problem, there is no sense of urgency nor a willingness to get involved. We can only become part of the solution when we acknowledge that there is a problem and something has to change. We also want to somehow communicate to the youth of Hong Kong that there is hope and there is something greater to live for. 1) You are PRECIOUS and dearly loved. Even though you might not feel like it, you are beautifully and wonderfully created by God. Your life has value and worth. Regardless of what people said to you in the past, the most important thing is what God says about you. He does not create “useless” things, but rather God creates beautiful things. You are one of God’s greatest creation. 2) You have a PURPOSE in life. Every life has a purpose. We are not placed here on earth accidently or aimlessly. You might not realize it nor see it at the moment, but your life has great purpose. Each person has a reason for existence. One of the greatest joys you will experience in life is finding out that purpose and living it out passionately. You matter, therefore, fulfill your purpose. 3) You can PERSEVERE with a community who cares for you. Life was not meant to be lived alone. We were made for community. Too often, we find ourselves isolated and separated from people. This is the reason why a person might find it hard to have the strength to endure their situation. But when we are surrounded by people who genuinely care and love us, then we feel supported. Don’t go on in the journey of life alone. There are people who love you and care for you. Just speak up and share. 4) Your PAIN will not be wasted. One of the wonderful things about the word, “redemption” or “redeem” is the fact that it conveys the idea of making something better or restoring something to its original intent. Sadly to say, in this world, due to sin, there will always be pain. But that is never the end of the story. Since there is a God who is working “all things for the good,” we can be confident that He will use every single hurt and pain for something glorious. For every tear that we cry, God will use it to water beautiful flowers in our lives. There is hope. I want to encourage you to seek help. Don’t fight this battle alone. There are people who believe that you matter. We started a campaign called, “You Matter” to bring awareness to the people of Hong Kong. 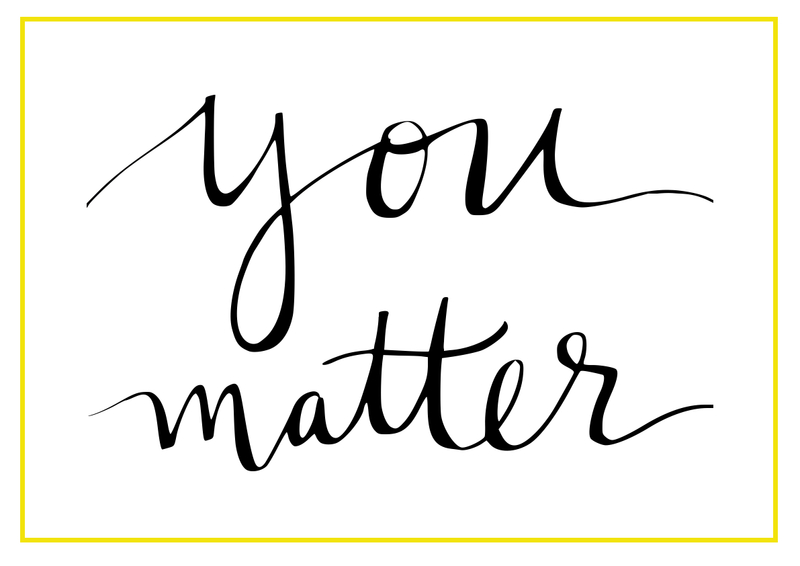 You can check out our You Matter website, as well as look at some of the people on our Instagram posts who want to remind you that you matter. We would also love to connect you with a community of young people who care for you. Just sign up to at the bottom of the You Matter website to get connected.